Home › Features › ‘Frogfoot’ down — what happened? ‘Frogfoot’ down — what happened? 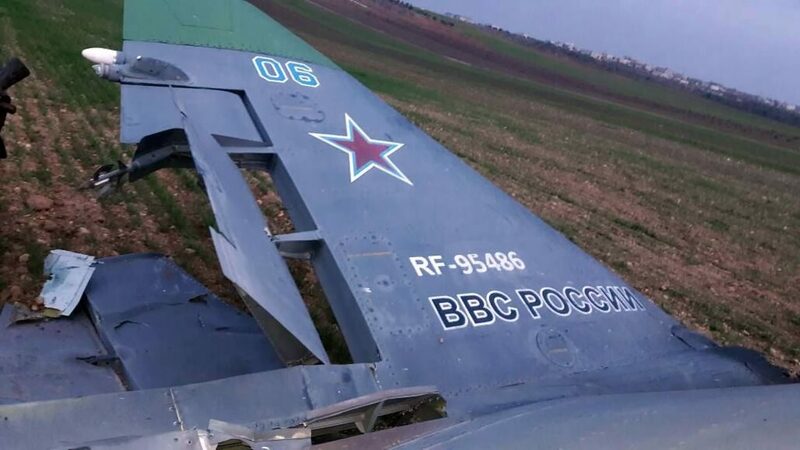 On February 3, Russian Air Force Su-25SM ‘Frogfoot’ RF-95486 ‘06 Red’ piloted by Maj Roman Nikolayevich Filipov was shot down over the village of Saraqib on the outskirts of Idlib. Maj Filipov was providing close air support using S-8 unguided rockets from four B-8M1 rocket pods on his jet. Two terrorist groups present in the area at the time claimed responsibility: the al-Qaeda-affiliated Hay’at Tahrir al-Sham (HTS) and Jaysh al-Nasr (JN), the latter linked with the Free Syrian Army. An initial analysis of available video footage suggests the aircraft was targeted first by an HTS-launched MANPADS after the Su-25 pilot launched several S-8 rockets at JN positions in Saraqib. The anti-aircraft missile hit the Su-25 in the tail section causing a fire in at least one of its engines. The pilot decided to continue his flight on one Soyuz/Tumansky R-195 turbojet engine but seconds later, after he passed above a Jaysh al-Nasr position, his jet was targeted by 23mm rounds from a ZU-23-2 anti-aircraft gun belonging to JN, resulting in the loss of the second engine. The pilot ejected safely after the tail of his aircraft separated and he lost control. Once Filipov was on the ground he contacted his air base, at Khmeimim, and gave his position for evacuation. A pair of Mi-8AMTSh-V CSAR helicopters, to be escorted by a pair of Mi-24P attack helicopters, was quickly prepared for the CSAR mission while Filipov’s flight lead flew over him to provide cover for the incoming CSAR team. Their time of arrival at Filipov’s location was estimated to be a maximum of 40 minutes. JN jihadists reached Filipov first and tried to capture him, but he resisted using his Stechkin handgun. Finally the Jihadists killed him with a hand grenade. A few hours after the accident, Russian Su-25SMs bombed the towns of Saraqib and Maarrat al-Numan where the wreckage of ‘06 Red’ was located. They used cluster bombs not only to destroy the wreckage but also to kill several JN fighters. The rebels in turn claimed that this bombing also killed 14 civilians in the nearby village. At the same time a Russian Air Force Forpost UAV located HTS hideouts that were targeted by Kalibr-NK cruise missiles launched by Russian Navy ships in the eastern Mediterranean minutes later, killing at least 30 insurgents, according to the Russian Ministry of Defense. Is the Russian campaign over? The Russian Air Force has been heavily engaged in CAS missions in support of Syrian Arab Army units advancing in Idlib province since the last week of January. Because of the importance of CAS missions during the Syrian Army offensive, eight more Su-25SMs from the 368th Independent Assault Aviation Regiment (ShAP) were forward deployed from Gvardeyskoye air base, Crimea, to Hmeimim air base in January, increasing the number of Su-25s at the base to ten. The 368th ShAP was reformed at Gvardeyskoye, a Russian Navy Aviation Black Sea Fleet base in Sevastopol, Crimea, in spring 2015. A total of 16 Su-25SM/SM2/SM3s and Su-25UBs were allocated to the unit, 10 of which were always kept operational and fully mission capable to be used during any possible offensive Ukrainian armed forces in Crimea. The Su-25 and its modernized variants lack IR missile approach warning systems and other self-defense equipment to warn the pilot and protect the jet from MANPADS. It seems that the Russian military underestimated the threat, believing that terrorists around Idlib didn’t have any such weapons. This resulted in Su-25 pilots flying at low altitude and carrying out rocket attacks and bombing without even automatically launching flares. The loss of ‘06 Red’ reportedly led to an order calling for Su-25 pilots to not fly lower than 5,000m (16,404ft) over the battle zone in Syria to remain out of MANPADS range. The MANPADS used is believed to be a Chinese-made FN-6 of the type reportedly delivered to the HTS and its allies in 2017. The same MANPADS were supplied to various al-Qaeda-affiliated groups in Libya who managed to shoot down several aircraft from the Libyan National Air Force and Army between 2015 and 2017 — these included two MiG-23BNs, a MiG-23UB, and a Mi-17 carrying French special forces near Benghazi.